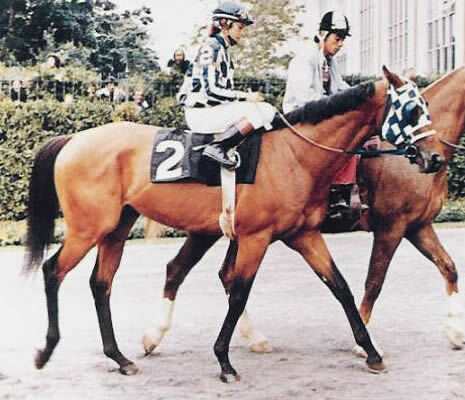 Riva Ridge was a thoroughbred racehorse, the winner of the 1972 Kentucky Derby and Belmont Stakes. He was owned and bred by the Meadow Stable of Christopher Chenery. The horse's name came from Chenery's son-in-law, John Tweedy, a soldier in World War II at the important strategic victory by the U.S. Army's 10th Mountain Division on February 18, 1945 at Riva Ridge in the North Apennine mountains of Italy. The equine Riva Ridge was elected to the American Hall of Fame in 1998. A winner of the Eclipse Award at age 2 and 4, Riva Ridge was ridden principally by Hall of Fame jockey Ron Turcotte, who would also ride stablemate Secretariat. Riva Ridge never ran well on muddy tracks, and was upset in the Preakness Stakes after rain caused a sloppy track. In the 1 1/2 mile Belmont Stakes, Riva Ridge defeated nine other horses, running away to a seven-length victory. At age four, Riva Ridge won five of the nine races he entered, set track records four times, and equalled the 1 1/8 mile track record at Suffolk Downs in winning the Massachusetts Handicap. His winning time of 1:52 2/5 in the Brooklyn Handicap, raced that year at Aqueduct Racetrack, set a North American record for 1 3/16 miles on dirt. His mark was equalled by Farma Way in 1991 at Pimlico Race Course. As of January 2008, their record still stands. With much fanfare, the Philip Morris company (manufacturer of the best-selling Marlboro cigarette brand) sponsored what was to be a match race with stablemate Secretariat. After both horses were beaten in preparatory races for the match, it was changed to an invitational race that brought together the top horses of age 3 years and up. In record time, Secretariat, ridden by Turcotte, defeated Riva Ridge, ridden by Eddie Maple. During their careers both horses wore the blue and white checkers of Meadow Stable. Riva Ridge was retired at the end of the 1973 racing season. He stood at stud on Claiborne Farm in Kentucky for his entire breeding career until he died at age 16 of a heart attack on April 21, 1985. In thirty starts, Riva Ridge won 17, placed in three, and came in third in one. His life earnings amounted to $1,111,497. "Riva Ridge" is also the name of a ski run at Vail Mountain in Colorado. The resort was co-founded in 1962 by Pete Seibert, also a member of the 10th Mountain Division. It is the longest run at the resort.